But meetings aren’t going away. The Bain survey also found that, on average, senior executives devote more than two days every week to meetings involving three or more coworkers, and 15% of an organization’s collective time is spent in meetings—a percentage that has increased every year since 2008. So how can you improve the effectiveness of meetings? What’s the key to making group ideation, problem solving and collaboration work better? At Ink Factory, these are questions we help companies answer all the time. One proven solution we offer is graphic recording. Our team of experienced artists have helped companies in a wide range of industries all over the world use visual notetaking to create memorable, engaging meetings. And this isn’t simply our opinion. 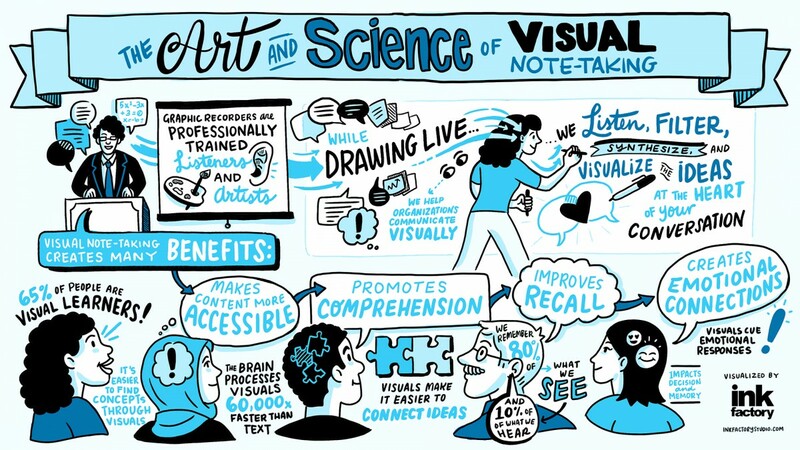 Science is on our side—here are four proven benefits of using visual notes. People are much better at seeing concepts in visuals than text1. In fact, the brain processes visuals 60,000 times faster than text2. This means when visual notes are incorporated into a conference or meeting, the audience will be able to more quickly process what is said. Research shows that when content is presented visually, people have an easier time drawing connections between ideas, leading to more and better ideas3. If you’re discussing complex information or want your audience to actively share ideas, visual notetaking can help drive understanding and participation. We remember 80 percent of what we see, but only 10 percent of what we hear4. This is because words are abstract and difficult for the brain to retain, but visuals are concrete and more easily remembered. If you’re educating a group about a new product or process, visual notetaking can help people better remember key information. Thanks to the wiring in our brains, visuals cue emotional responses. These emotions are responsible for the decisions we make, and how well we remember information. Incorporating visual notes into a meeting or event is a great way to drive engagement and participation. Want to see the impact of visual notetaking in action? Check out our recent post—Who’s Using Visual Notetaking?—for a look at how companies like Autodesk, Whole Foods and the Chicago Theological Society are benefiting from visual notes. Have a meeting in mind that could benefit from visual notetaking? Let’s talk! Trafton, A. (2014, January 16). In the Blink of an Eye. Cambridge, Massachusetts, United States of America. Semetko, H. A., & Scammell, M. (2012). SAGE Handbook of Political Communication. SAGE Publishing. Shiv, B. (2014, February). Science of the Creative Mind. Inc., p. 86. Lester, P. M. (1996). Syntatic Theory of Visual Communication. Fullerton, California: California State University, Fullerton.